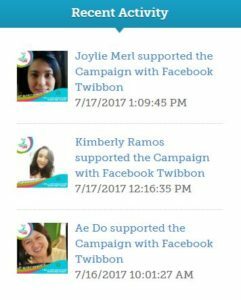 In July 2017, people across the Philippines celebrated a National Nutrition Month with various activities across the country led by the National Nutrition Council. Every year, a theme is chosen to highlight an important and timely concern on nutrition, as approved by the National Nutrition Council Technical Committee. 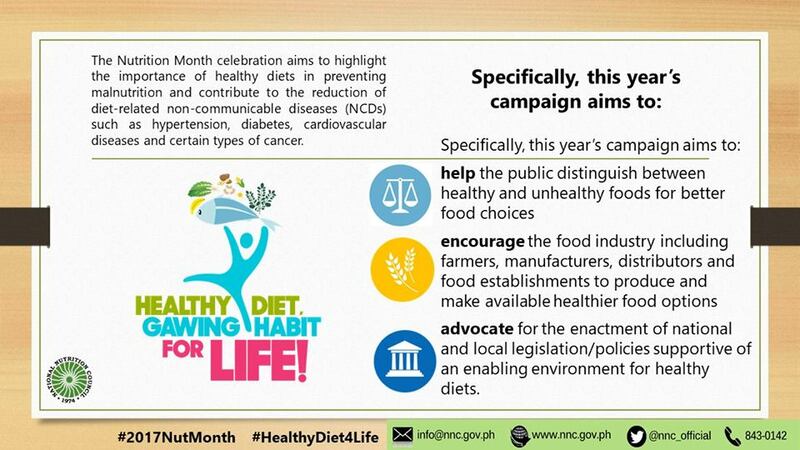 For 2017, the focus of Nutrition Month was on the promotion of healthy diets under the theme, “Healthy diet, gawing habit – FOR LIFE!” to increase awareness of healthy diets which protect against both under and over nutrition and non-communicable diseases (NCDs) such as hypertension, diabetes, cardio-vascular diseases and certain types of cancer. Paulyn Jean Rosell-Ubial, Secretary Department of Health, Philippines. Various elements of the month-long campaign helped the public distinguish between healthy and unhealthy foods for better food choices. In addition, the campaign encouraged the food industry, including farmers, manufacturers, distributors and food establishments, to produce and make available healthier food options. advocate for the enactment of national and local legislation/policies supportive of an enabling environment for healthy diets. Moreover, National Nutrition Month provided activists across the country with greater visibility to advocate for the enactment of national and local legislation/policies supportive of an enabling environment for healthy diets.